Waterloo – Wilfrid Laurier University will hold its spring convocation ceremonies in June. 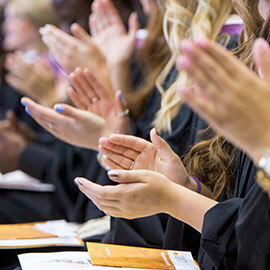 Three ceremonies will take place at Laurier’s Brantford campus June 6 and 7, and 11 ceremonies will be held on Laurier’s Waterloo campus between June 12 and 16. As of May 31, approximately 2,865 students had met all program requirements and qualified to graduate. Laurier expects to confer 247 graduate degrees, 2,609 undergraduate degrees and 9 diplomas. On average, 80 per cent of Laurier graduands attend convocation ceremonies. This year’s spring convocation marks the university’s 100,000th graduate, and the 5,000th student to graduate from Laurier’s Brantford campus. In Waterloo, this year also marks the first convocation ceremonies to be held in Laurier’s new Lazaridis Hall auditorium. In addition to recognizing the hard work and dedication of all of its graduands, the university will feature the stories of Nairn Carter, who overcame personal challenges to achieve her degree, and Ann and Maverik Lyddon, a mother and son who are both graduating from Laurier at spring convocation. The Order of Wilfrid Laurier University will be presented to Carl Zehr, the former and longest-serving mayor of the City of Kitchener, on June 16 at 1 p.m. (Lazaridis Hall, Waterloo). View a complete convocation schedule.